Where a high-voltage underground cable joins onto an overhead line, the transition from one to the other usually takes place at a "sealing end compound". The overhead line finishes on a terminal tower. Downleads bring the conductors down to join on to where the ends of the underground cables come out of the ground. There may also be some monitoring equipment, but usually no transformers or switchgear. Lower voltage lines often transfer from overhead to underground on the pylon or pole itself, without needing a separate compound. But the space required at 275 kV and 400 kV to maintain all the clearances usually precludes this. In EMF terms, there is no equipment within a sealing end compound that produces significant EMFs itself. 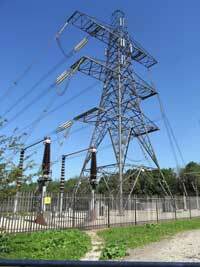 The EMFs are basically entirely produced by the overhead line and underground cable.